Check out information on best time to visit Char Dham in India. Know more about the peak season/ideal time to visit Char Dham, Uttarakhand. Char Dham are the four religious sites located in the northern state of Uttarakhand. Nestled in the lap of the snow covered peaks of Himalayas, these places are taken in high regard by the people of India. 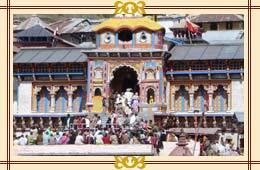 The Char Dham sites are Yamunotri, Gangotri, Badrinath and Kedarnath. A religious hub, Chardham is considered the holiest religious circuit in the country and is visited by thousands of pilgrims every year. However, one should keep in mind the best time to visit these places, before embarking on his journey. The ideal time or peak season to go for a Char Dham Yatra is from May to October, except monsoons. This is because; all the four sacred sites are perched in Garhwal Himalayas, which is prone to heavy snowfall. As a result, all the passage leading to the shrines are blocked. Moreover, during the monsoon season, there is undue threat of having landslides, which can further disrupt the journey. For safety reasons, the gates of the temples are also closed for this period of time and the idols are shifted to nearby pilgrim points.